San Diego-based biodiesel producer New Leaf Biofuel has been approved for a grant from the California Energy Commission for nearly $3.8 million, which will help fund an expansion project to double production capacity on-site from 6 MMgy to 12 MMgy. Two related cases, advancing in parallel, have the potential to upend California's LCFS, whether via full suspension of the LCFS or carving out diesel fuels from the deficit and crediting regime. Both cases involve challenges by POET LLC. Minnesota Soybean Processors and its subsidiary North Dakota Soybean Processors are moving forward with plans to build a $240 million soybean crush facility and refinery in Spiritwood, North Dakota. The complex will include a 30 MMgy biodiesel plant. German biodiesel exports in 2016 reached approximately 463 million gallons, up 3.4 percent. Imports increased 38 percent to roughly 216 million gallons, the highest since 2012. 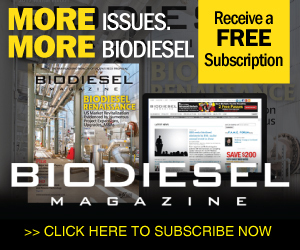 U.S. imports of German biodiesel rose by nearly seven times. Renewable Energy Group reported its Q4 and full-year financial results. The company produced 445.5 million gallons of biomass-based diesel in 2016, up from 300.3 million in 2015, and gross profit hit $171.5 million compared to $110.5 million in 2015. With help from investors, Cielo Waste Solutions plans to fast-track deployment of its renewable diesel technology at a shuttered, gutted biodiesel plant in Alberta. Whether CWS can turn its dreams into cash returns for investors remains to be seen. When it comes to American biodiesel, jobs and economic opportunities are the hot tickets. In Washington, D.C., from across the nation, biodiesel industry leaders are meeting with key influencers in early March to spotlight America's advanced biofuel. The initial crop project on 115 acres will expand diversified agriculture by growing combine-harvested oil crops on land previously used for sugar cane production. Pacific Biodiesel hosted a Hawaiian blessing Feb. 24 to mark the project's beginning. REG announced several recent milestones, including five months of continuous full production in Geismar, 100 percent ownership of Petrotec's assets in Germany, and surpassing 2 billion gallons sold with the second billion coming in just 33 months. Extension agronomist Stephen Kaffka and his team at UC Davis, including project scientist Nic George, explored growing cool-season crops such as canola and camelina in the same areas where California farmers typically grow warm-season crops. In advance of its annual Biodiesel Day on the Hill, the Iowa Biodiesel Board announced Feb. 27 the state's capacity to produce biodiesel is on the rise by nearly 20 percent, from 334 to almost 400 MMgy. Plant expansion projects led to the boost. On Feb. 21, the 200-foot Sailing School Vessel Oliver Hazard Perry took on 6,000 gallons of B20 provided by a local biodiesel producer at Newport Shipyard in Rhode Island, beginning its voyage from New England to Florida and then on to Cuba in March.